The instrument cluster is the driver's information centre. • The needles in the instrument cluster will sweep across the dials when you switch on the ignition. 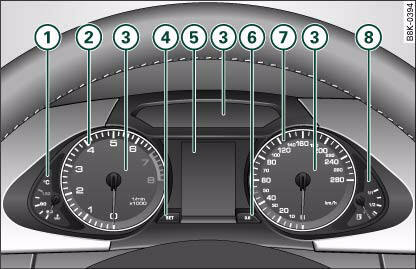 • The instrument lighting (illumination of dials and needles) is switched on when the ignition is on and the vehicle's lights are off. The instrument lighting is dimmed automatically as the daylight starts to fade. This function is intended to remind the driver to switch on the dipped-beam headlights in good time when light conditions become poor. The coolant temperature gauge only works when the ignition is switched on. In order to avoid possible damage to the engine, please read the following notes for the different temperature ranges. If the needle is still in the lower range of the dial, this indicates that the engine has not yet reached operating temperature. Avoid high engine speeds, full acceleration and heavy engine loads. In normal operation the needle will settle somewhere in the centre of the dial once the engine has reached operating temperature. The needle may also go further up when the engine is working hard at high outside temperatures. This is no cause for concern provided the warning symbol in the display does not start flashing. If the symbol lights up in the display, this means that either the coolant temperature is too high or the coolant level is too low. If the needle is at the top end of the dial, this means the coolant temperature is too high. Stop the vehicle, switch off the engine and wait for it to cool down. If the warning lamp starts flashing again after just a short distance, contact a qualified workshop. • Before opening the bonnet and checking the coolant level, please observe the warning information on, “Working on components in the engine compartment”. • Never open the bonnet if you can see or hear steam or coolant escaping from the engine compartment; there is a risk of being scalded. Wait until you can no longer see or hear escaping steam or coolant. • Additional lights and other accessories in front of the air inlet reduce the cooling effect of the radiator. At high outside temperatures and high engine loads, there is a risk of the engine overheating. • The front spoiler also ensures proper distribution of the cooling air when the vehicle is moving. If the spoiler is damaged this can reduce the cooling effect, which could cause the engine to overheat. You should obtain professional assistance. 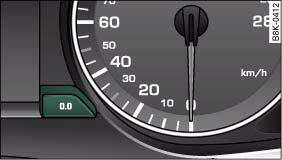 The rev counter indicates the number of engine revolutions per minute. You should select a lower gear if the engine speed drops below 1500 rpm. 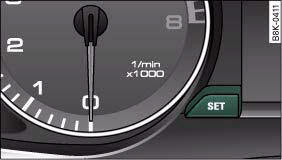 The start of the red zone on the dial indicates the maximum engine speed which may be used briefly when the engine is warm and after it has been run in properly. However, it is advisable to change up a gear or move the selector lever to “D” (or lift your foot off the accelerator) before the needle reaches the red zone. Never allow the rev counter needle, fig. 2 to go into the red zone on the dial for more than a very brief period: there is a risk of damaging the engine. The start of the red zone on the dial is different for some engine versions. Changing up a gear early will help you to save fuel and minimise engine noise. This button has a number of different functions. The display will appear for about 30 seconds if you press the SET buttongggggg 12, fig. 3 when the ignition is switched off. The auto-check control checks important components and vehicle systems. These background checks are run constantly, as long as the ignition is switched ongggggg 30. You can start the “check procedure” manually by pressing the SET button with the ignition switched on. This function check can be started at road speeds up to 5 km/h. A red or yellow symbol appearing in the instrument cluster display is normally accompanied by a corresponding message. The message will disappear from the display after about 5 seconds. If required, you can call up the message again by briefly pressing the SET button. You can press the SET button briefly to set speed limit warning 1 while the vehicle is moving. If you press and hold the SET button, this will cancel the speed warning. The date, time and display format can be changed using the sound system or MMI* control console. Please refer to the sound system or MMI* Operating Manual for more details. When the clock is in “radio-control” mode the signal reception symbol (a radio tower with radio waves) appears in the display ⇒ fig. 4. It is then not possible to change the minutes or the date manually. • The digital clock and mileage recorder displays are switched on for about 30 seconds when the driver's door is opened. • When the ignition is switched off, the clock and date display can be switched on for about 30 seconds by pressing the SET button, fig. 3. The instrument shows how far you have travelled. The mileage is stated in kilometres (“km”) or “miles”. You can switch the display from kilometres to miles and vice versa via the sound system or MMI* using the CAR button on the control console. The odometer records the vehicle's total mileage. The trip recorder shows the distance that has been travelled since it was last reset. It is used to measure individual journeys. The last digit of the trip recorder indicates distances of 100 metres or tenths of a mile. The trip recorder can be reset to zero by pressing the reset button ⇒ fig. 6. If there is a fault in the instruments, the letters dEF appear permanently in the trip recorder display. Please have the fault rectified as soon as possible. When the ignition is switched on, the security programming of the ignition key is verified electronically. If an uncoded key is used, SAFE will appear continuously in the mileage recorder display. The vehicle cannot then be driven. • The date, time and recorded mileage will continue to be displayed for about 30 seconds after you switch off the ignition. • When the ignition is switched off, the mileage recorder can be switched on for about 30 seconds by pressing the button, fig. 3.